The train-tablet system is operated to implement a train-spacing system designed to prevent more than one train occupying a single line section between any two tablet-stations at one and the same time. When the line is not occupied ( “Line Closed” ) their operation may permit the admittance of a train from one or other end of the tablet section. 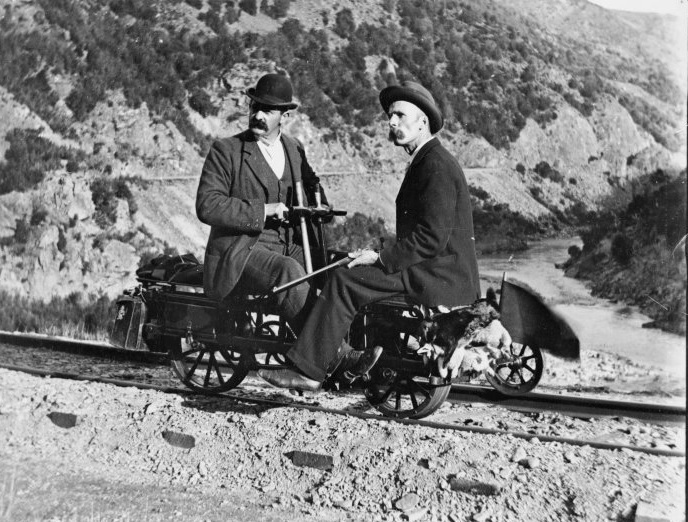 This is accomplished by requiring the driver of each train to carry an appropriate tablet, a hard-wood disc familiarly know as the biscuit. The biscuits not in active use are naturally locked up within the tablet instruments. The Tablets are severely rationed, not more than one can be extracted from the relevant cupboard at any one time. Control of the cupboards is remote. The unlocking of the instrument at the approach end of the section involves complementary action by the tablet porter at the terminal end, the one to which the given train is travelling, the withdrawal of the tablet leaves locked the instrument from which it is taken. It cannot be unlocked again for the obtaining of a successive tablet until the operator at the far station inserts into his own machine the tablet that has been carried along the entire section. It is however possible for a tablet to be replaced into either machine. collect is sitting in its holder at the bottom. match their relative Tablet Machine. 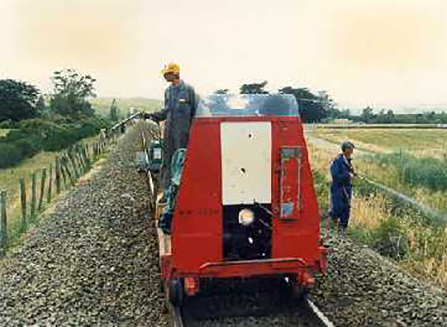 Way & Works petrol powered motor trolley being used for weedspraying services in the Woodville area 1988. Inspector of Permanent Way sitting on trolley stand with hand trolley waiting to cross trains. 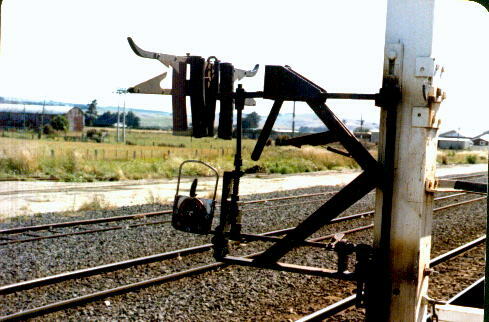 These vintage hand propelled jiggers were in use on the NZ Railway system for many years. 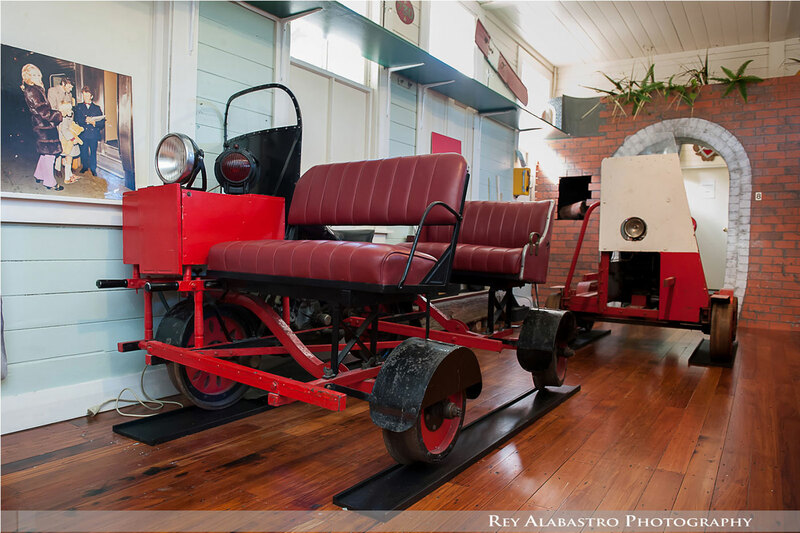 They were employed when the Paekakariki Station was built in 1910, and were used right up until the 1960’s. Track Gangers and surfacemen travelled for many miles on them and soon built up very strong arms and shoulder muscles. The outrigger is detachable to allow for easy off-tracking. 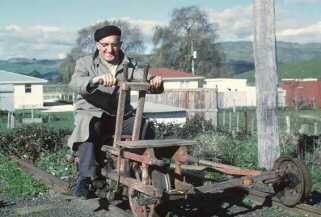 The old hand propelled jiggers were replaced with petrol powered velocipedes. 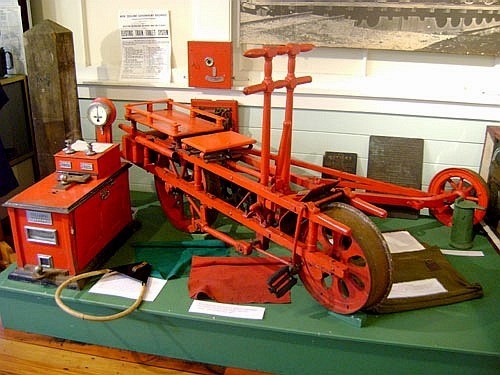 In earlier days the task of filing records of sleeper laying and/or replacing was not within the scope of the average ganger or permanent way worker. 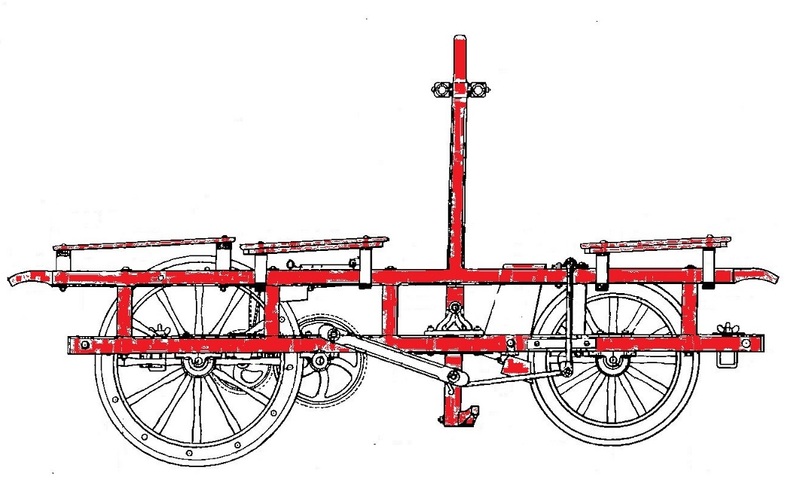 Such information was essential to the Railway’s records to gauge the lasting qualities of various types of timber used in sleepers in different areas. A departmental official in 1903 referred to an advertisement in a trade magazine relating to the date nails of the company of John Milliken of Belfast, Ireland. Subsequent enquiries revealed that the nails cost £2.5s per cwt, (approximately 4,500 nails). An order was apparently placed for 100,000 in 1904, just the first of many thousands to be imported into New Zealand over the next 23 years. The head of the nail is ¾ inch in diameter with the shank being 1¼ inch long and approximately 1/8 inches square below the head tapering to a blunt point. 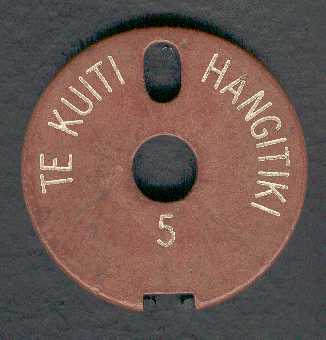 The head has one or two numerals raised on the surface. 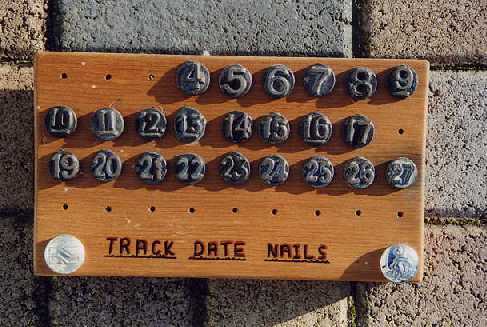 These numbers indicate the year in which the particular sleeper was placed in the track and are in direct relation to the year, i.e. 4 indicates 1904, 5 is 1905 and so on. When Were They Used? 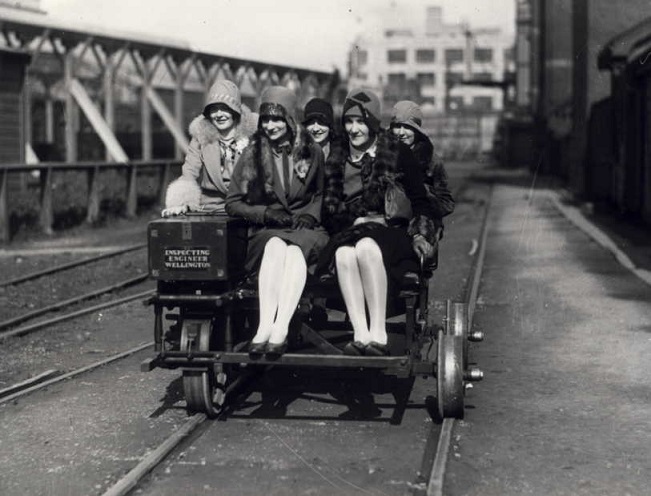 : The initial shipment of 4’s was subsequently used up to, and including, 1927. Enquiries were made of gangers as to their needs for 1928 and 1929 but no nails for these years appear to have arrived. Also in 1939 and 1940 it was considered desirable to re-introduce the use of nails, but nothing appears to have come from the proposal, possibly because of wartime conditions. The continuity of use from 1904-27 is subject to some discussion when 1918 is being considered. Departmental records definitely state that there were no nails used in 1918 and, originally, 1919 but apparently some 19;s became available later as 40,000 are shown as arriving on the “Remuera” ex London. In the same shipment were 60,000 for 1920. To overcome the lack of 18’s and 19’s, the following provisions were made: to indicate 1918 two nails were to be used with their heads touching, while for 1919 two were to be used also, but one head diameter apart. Where Are They Found”: Very few are to be found in the track now, possibly some sidings which might still have old sleepers. They still do turn up from time to time in fence posts adjacent to the track. 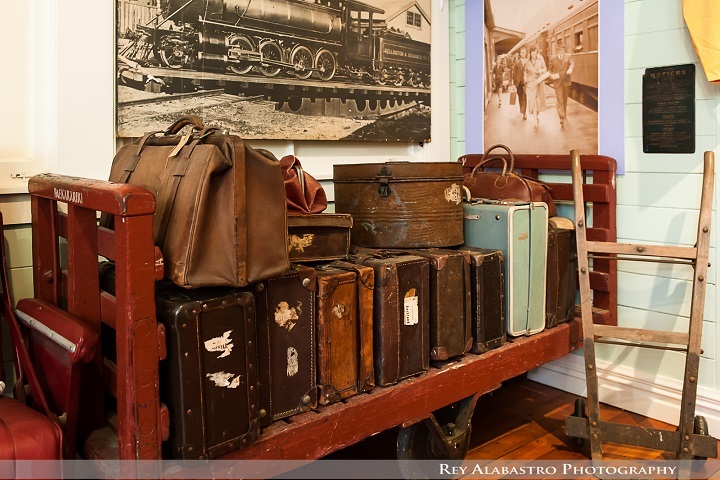 Today they form part of the railway memorabilia that is considered collectable.